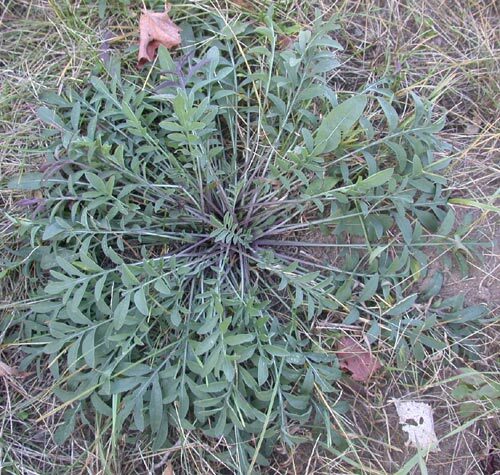 Centaurea maculosa is a biennial or short-lived perennial herb to 1.5 m tall, stems and leaves pale, gray-green, overwintering as a rosette, can resprout from root crown for several years and reproduce vegetatively from lateral shoots that emerge to form new rosettes; flowering plant much branched. Leaves alternate, deeply pinnately lobed, lobes narrow to linear, leaves of inflorescence small, linear, entire; inflorescence widely branched, flower heads urn-shaped, with several layers of bracts, 0.6 cm wide, to 2 cm tall, lower bracts of flower head with tips blackish, regularly pinnate appendage 1-3 mm long, having a spider-like or feather-like appearance. Centaurea maculosa basal rosette. T. Breitenfeldt. War on Weeds. mtwow.org (Accessed 12/2014). Flowers purple, tubular, marginal flowers, enlarged, ray-like, with long, narrow petal lobes pollinated by insects, plants are self-compatible, June-Oct.
Fruit dry, 1-seeded (achenes) greenish with 4 yellow lines crowned by ring of short bristles to 0.3 cm long (Levine 1995). Seeds produced by one plant approx. 436 per year. Seeds eaten by rodents (Martin et al. 1951; Watson and Renney 1974). 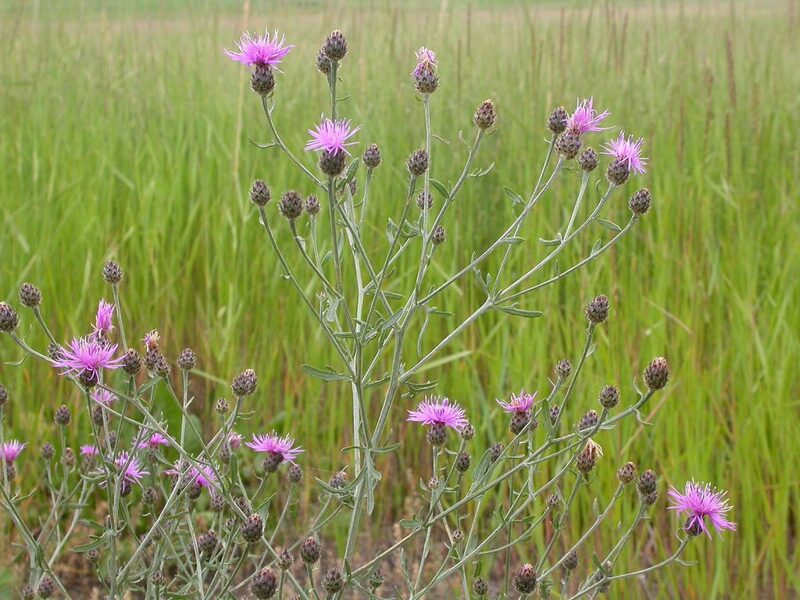 Notes: The most common knapweed, aggressive in some areas. Attacked by numerous insects (Watson and Renney 1974). An unidentified insect larva was observed filling the entire achene, apparently having eaten and displaced the seed within (M. Gargiullo personal observation). Listed as one of the “top twenty” invasive alien plants by the NYS Natural Heritage Program’s Ad hoc committee on invasive plants. 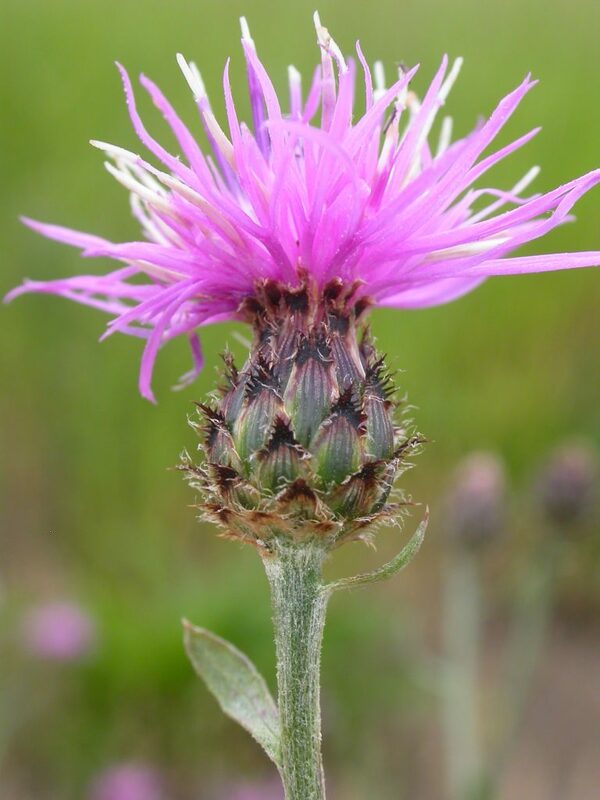 Work by Bais et al (2002) has shown that the roots of spotted knapweed exude catechin, a phenol-based chemical, in two geometric forms. One form inhibits growth of soil bacteria and both strongly inhibit establishment of other plants (phytotoxins). However the phytotoxicity is not in levels suitable for development of a herbicide (J. Vivanco personal communication). .